Greetings from inside the beltway (Washington, DC)! Our group of advocates descended upon the city Monday for the Alzheimer's Association Advocacy Forum. Depending on your perspective it is the culmination or launch of a year of advocacy work (or both). Sometimes our volunteers tell me that advocacy work seems ambiguous or intimidating. The slow turn of democracy also makes your efforts sometimes feel futile. This is my 5th year of attending the advocacy forum. My first year attending in 2008 I was overwhelmed with the crowd of 400, this year there are nearly 1,000 advocates in attendance! This advocacy thing is really catching on. To put it simply, we have to make our lawmakers understand the growing crisis of Alzheimer's disease. Alzheimer's is THE most expensive disease in our country, with costs only expected to skyrocket. This year, Alzheimer's cost more than $200 billion! What is my mother worth? Don't we owe it to our mothers, fathers, sisters, brothers, children, grandchildren to raise our VOICE? Complacency will get you nothing. Advocacy will get you everything. 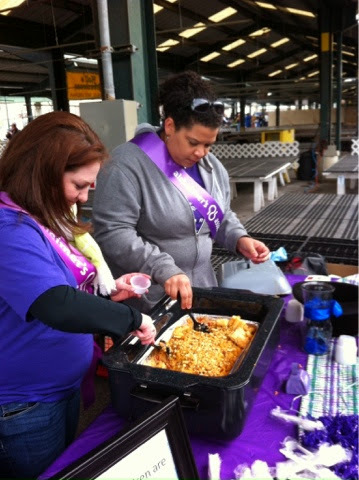 As you know our Charleston office rallied to support the Childhood Language Center's Mac&Cheese cook off on Saturday. We came together and built a recipe using each of our favorite parts of our personal Mac&Cheese recipes. I know it sounds gross but it actually came our amazing! We stole the stove top stuffing topping from Kaarmin, fire roasted tomatoes from Jennifer, I offered up my love for spicy Mac&Cheese, and Kelsey's healthy version didn't really fit the bill but her selection of noodles was key. You won't believe this, but WE WON!!! By ALOT!!! People were calling their friends to come down to the cook off to try our Mac&Cheese! We even beat the restaurants! 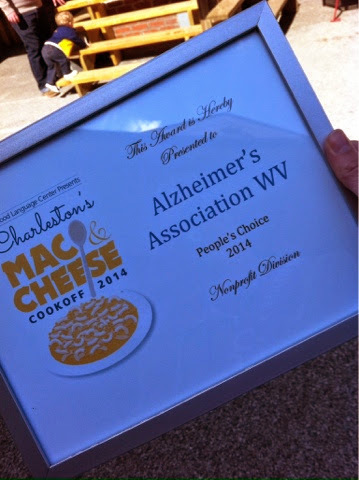 SO, without further ado our AWaRD WINNING Memorable Mac&Cheese! Boil pasta according to package directions. Remember, your pasta water should taste like the sea! I would also recommend pulling the pasta out just shy of al dente because pasta will soak up the cheese and continue to soften just a bit while in the oven. While pasta cooks, add crushed stuffing, half palm-full of Tonys and some cheese together. Set aside. In separate pot, melt butter. Add flour and stir together until combined. Let cook for a couple minutes so that the raw flower taste can cook out. Add milk and half and half and stir to combine. Allow sauce thicken. Once thickened add mustard, Tony's and pepper and stir to combine. ONce combined, add cheeses a little at a time, giving each addition time to melt into the sauce. A little more salt and pepper may need to be added, depending on taste. After all the cheese is melted and the sauce is a delicious, velvety dream, add to pasta, along with fire roasted tomatoes. Stir. Add topping and bake, 375 for about 20 minutes or until top is golden brown. Try not to eat the whole pan in one sitting!! See you back in Charleston next week!